1) Everyone obviously copied me when they decided to create this fad. I don't like thieves. I also don't appreciate it when nobody gives me credit for things I started. 2) She's only cute to a certain extent. Just look at that HKHell site for a few minutes and you'll start vomiting pinkness, and hearts, and flowers... big, white-headed, beady-eyed flowers with bows in their hair. 3) It's become too much of a fad now. To me, she was cool to like when nobody else liked her. Now she's cool to like, so I'm bored with it. 4) Hello Kitty waffle makers. 'Nuff said. 5) Did I mention about how everyone copied me? Anyway, enjoy "Hello Kitty Hell." I think the influx of Hello Kitty crap is what makes Hello Kitty great...who DOESN'T want a Hello Kitty waffle maker??? Confession: I am a junkie for Japanese Alarm Clocks. I own 3, and pick up a new one any time I'm down your way. They all do the same thing...they play a RIDICULOUSLY catchy song when the alarm goes off (sometimes in Japanese), and then when you press the button, they yell "GOOD MORNING!" at you...even if the song was in Japanese, they yell "good morning!!" in plain ol' Ingles. 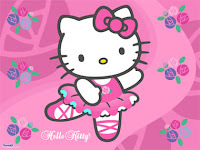 The best ones: Hello Kitty...I've got one so far, and the song is Top 40 material in my opinion. That is the HK one I have...the songs are infectious I tell you...go into one of those little underground mall things in Chinatown, and you'll find them...play one or two, and waking up will never be the same.